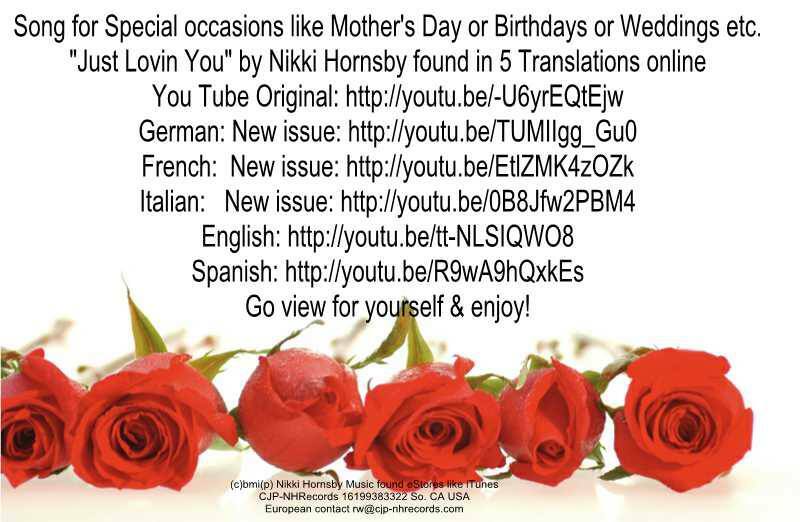 Just Lovin You, love song by Nikki Hornsby ,Recording Artist, GRAMMY Awards Nara Voter and founder of CJP-NHRecords Label is now in almost 5 languages ( with over 10K YouTube views in US) and available for licensing and/or artist re-recording in Europe as a duet! And soon in Spanish… “Just Lovin You!” for re-recording for international artist in single or duet! This entry was posted in Music Biz and tagged Artist Re-recording, CJP-NHRECORDS LABEL, English language, Featured, French language, German language, Just Loving You, Music Licensing, Nikki Hornsby, Spanish language, YouTube. Bookmark the permalink.